These days, people are some trying to go more natural and organic for aliments. There’s a man out of the Petoskey area that left a career to help people do just that. Corey Adkins shows you his story in this week’s Northern Michigan in Focus. The Pigeon River Valley: it’s a place of endless beauty. Even in the winter you see traces of life all around: beaver, woodpecker, coyotes. It’s a place where elk run free. It’s also where Nathan Wright works. “I started way back when I was a kid. I spent a lot of time out in the woods by myself. I didn’t have a lot of friends so I would go out and make friends with the forest,” explained Nathan, Herbal Lodge. After high school, Nathan enlisted in the Marine Corps. Then after that, he got into it at some of the pioneering internet companies. “But in the back of my mind, I was working with my plants and herbs,” said Nathan. The forest called Nathan back and he co-founded the Herbal Lodge. Now he spends his time walking through the woods, wild harvesting certain things that can help other people. “All our products have natural ingredients. They are organic and our wild harvested in the wild harvested part is probably one of the most interesting parts of what we do, because we have to go out in a beautiful forest like this, then find our ingredients and we have to do it in a sustainable manner,” explained Nathan. Like Minagin. He needs the buds from balsam poplar trees. “Minagin, which is 1000-year-old Native American time-tested remedy, and we make it into a topical salve and people use it for arthritis, fibromyalgia, nerve damage, anything that has to do with pain underneath the skin, including knee joint pain,” said Nathan. He also searches the forest for the ingredients for Nojmuk. 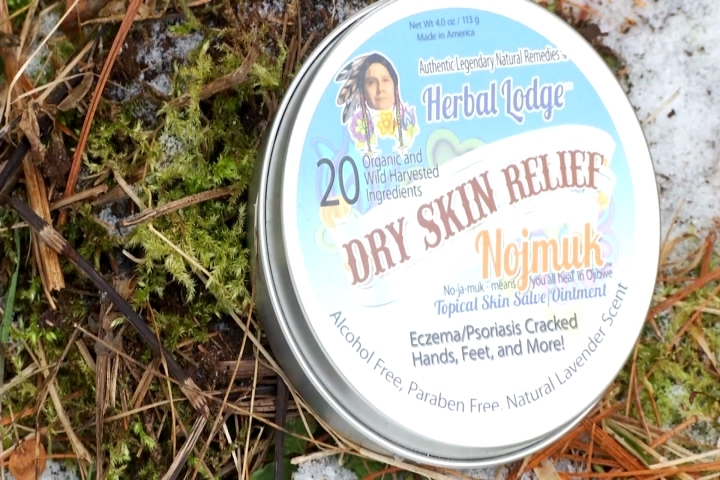 “Nojmuk, which means you all heal in Ojibwa, that’s good for dry skin, eczema, psoriasis, cracked hands, cracked feet, so it really helps people with skin conditions,” explained Nathan. On the white birch trees, he looks for a mushroom called chaga. “It’s just a really good mushroom. I have experienced a lot of good things for my health and well-being. I think it’s given me the ability to have a second and third wind. I drink 3 cups a day with my coffee and I can feel the difference when I don’t have it at all. It’s something that we completely promote as people harvesting it sustainably and don’t harvested if you don’t need it,” said Nathan. Yes, he does do this for his business, but it goes much deeper than that for Nathan. He uses his time in the woods to connect. Nathan is holding a class on building your immune system using herbs and mushrooms on Feb. 17. For more information, click here.